BEIJING, China (CNN) -- At least 184 people died in last weekend's violent protests in China's far-west Xinjiang region, state-run media reported. That number raises the death toll from a previously reported 156. On Friday, about 3,000 Muslims attended a weekly prayer themed at "peace and harmony" at Id Kah Mosque in the city of Kashgar, according to Xinhua news agency. But five major mosques near the center of Sunday's violence in Urumqi, the capital of Xinjiang, were closed Friday morning, Xinhua said. Some smaller mosques in the city were open. "Mosques in some sensitive areas were closed at their imams' suggestion," an official in charge of religious affairs with the Xinjiang regional government said. "Muslims normally perform rituals at home in time of plague or social unrest." The violent demonstrations Sunday also left more than 1,000 injured in the capital, according to government figures. Heavily armed troops remain on the streets of Urumqi and curfews are in effect. 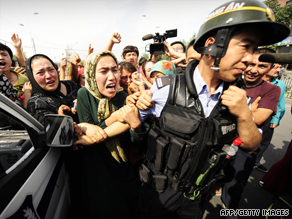 The violence is a result of ethnic tensions between the Uyghurs, who are predominantly Muslim, and members of China's Han majority. Hundreds of Han Chinese were on the streets of Urumqi on Tuesday, holding sticks and pipes, and calling for severe punishment of the Uyghurs, who they say committed serious crimes.